I went out walking in the woods today in the rain. I felt like the main character of a fairy tale. My heart was bursting with wonder and curiosity. After living in a Mediterranean climate that has been in an decade+ drought, I am in awe. I can’t help but marvel at the bubbling streams that meander all along the land and the waterfalls that cascade down moss-draped marble cliffs. The crystal clear pond is surrounded by a verdant green carpet of grass. I discovered a sacred symbol etched into a rock slab. Everywhere I walk or stand, I can feel the amazing vitality of this place. It’s very different than the dramatic beauty of the west coast that I came to love—where the towering cliffs and mountains meet the sparkling, blue sea. When I moved there, that was exactly what my soul needed. Space. Expanse. Dramatic beauty that made my questions and internal struggles feel small in comparison. I craved anonymity amongst the 20 million people there. I took comfort in the likelihood that within that high population, there would be at least a handful of likeminded souls. There, I felt as though I was a small speck witnessing the grandeur of something vast. It was difficult for me to imagine the transition back to this very different kind of ecosystem. Yet my heart kept feeling tugged back to the woods, the streams, the rich, dark earth, and a place where flourishing life is sustainable. We looked at many beautiful houses and amazing properties through the years, but none of them ever felt right. Some of them seemed so perfect on paper and logically they met the criteria we had, and I felt crazy with dissonance when my heart wouldn’t allow me to go through with it. But then once I stepped foot onto this land, the natural beauty felt so personal, it captured my heart in a different way. It felt like we were meant for each other, this place and me. 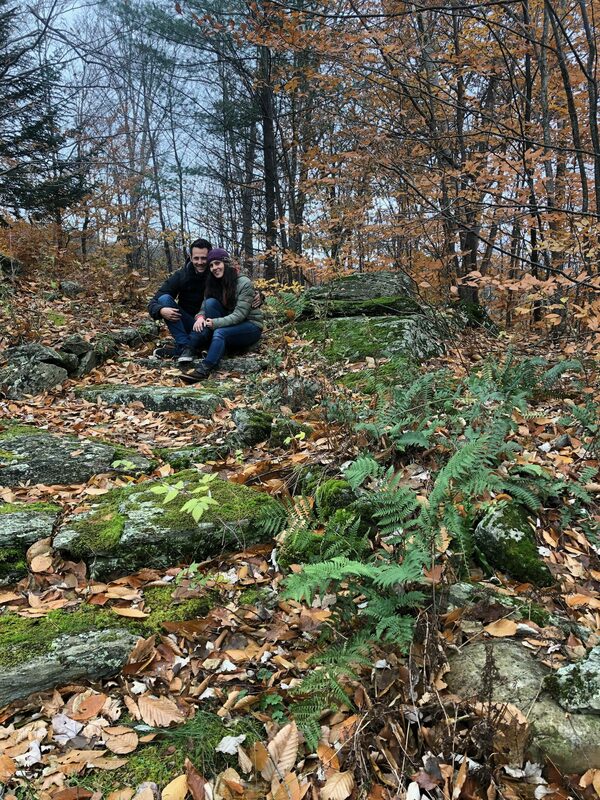 It’s a relational kind of experience to be here among these moss-covered boulders, crystal clear streams with pebbly beds, the rolling hills, the towering oaks and magnificent paper birch trees. The willows that grow right at the edge of the pond, the plum trees and berry bushes that are generous with their fruit in the summer, the fact that the power lines are all buried underground so there’s no buzz or sight of them from our home—these are all such meaningful details to me. The wooden and stone walkways and spots for meditation designed by the Buddhists who originally built this place as their retreat center all feel exactly perfect. 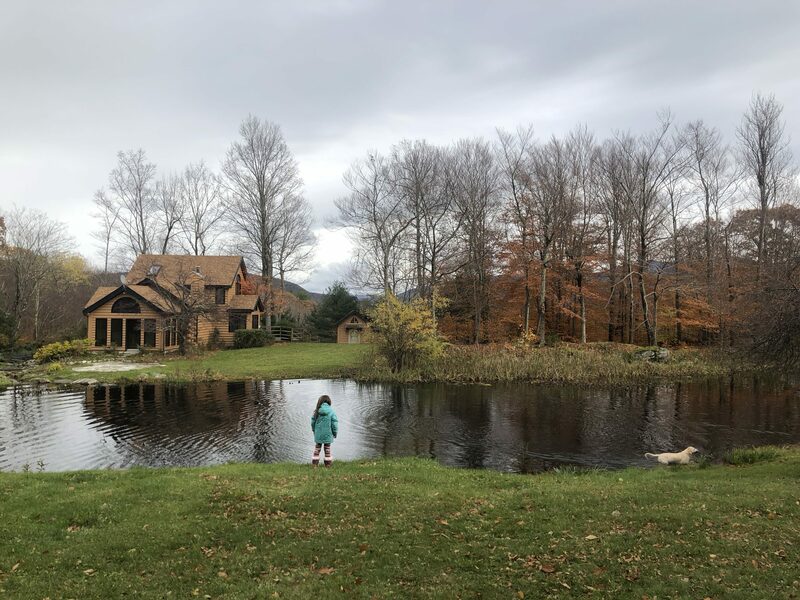 With the Taconic mountains in the distance as our backdrop, I am ever aware of nature’s grandeur, but I live presently within the more intimate context of my own, microcosm of wonder. It inspires me to greet each tree and boulder as if it’s a friend, and in my heart I do. I’ve dreamed of this space for so long, and every detail—even ones I didn’t consciously know I hoped for—are realized here. And for this time we’ve been granted, I’m grateful. When I was first thinking of leaving Topanga, California, to move here, I was afraid that I’d feel disconnected and isolated. Though we lived in a small mountain town where I could hike for miles with barely a soul passing me as I walked, our house was situated right between two roads. One road was only somewhat busy, but the other was traveled by 30,000 cars a day. And while that was unpleasant in terms of noise pollution, I never felt too remote or isolated. Here, the long gravel road leading to our residence leads to home for only a few. Our closest neighbor is a half a mile down, so we don’t hear or see any other cars unless we go at least that distance. To my surprise and relief, though, I don’t feel isolated. I feel more connected to my own life than I’ve ever felt because of this magical place. I’m also then able to really connect with the vitality of the nature surrounding me per se. And it feels so real—so accessibly nourishing—to my soul. I feel that paying attention to what’s around us here makes me aware of how genius this world is. The plants, the patterns, the cycles, the balance—there’s so much to absorb with awe. Being here provides endless opportunities for learning. Senya and Juniper must feel inspired too; they’re either playing outside, and reveling in all this land and water to interact with, or they’re in our workshop area making things. They seem to have been caught up in a current of creativity. I won’t hear from them for an hour, so I’ll go to check on them and they’re quietly lost in the flow of making—making paintings, sculptures, drawings, little boats to float in the pond and down the stream—all sorts of things. And so far, the families that we’ve met through our WiSe Forest School have welcomed us and included us right into their tribe here. We had our first lantern walk/potluck last night and got to know lots of our neighbors (‘neighbors’ means they live anywhere within a 20 minute drive, I think). We talked with people about their lives, and they asked us all about our story and how we came to Pawlet. They’re an inspiring bunch of people who all share the value of living sustainably within the land, making all sorts of artisan things, caring for the earth, caring for their families, and enjoying this beautiful life we all have. I miss our dear people in California, but I find comfort and a sense of closeness in my heart knowing that they will love it here when they come visit. I have a dream of developing this back into a place for family retreats, and I’m hoping that my friends from Los Angeles who want to experience this life (but can’t or wouldn’t want to do that full-time) can have a place to come for a few weeks each year to engage with this magical place. But for now, it’s a beautiful place to call home, and we are grateful for all the wonder and beauty that so tangibly surrounds us here. 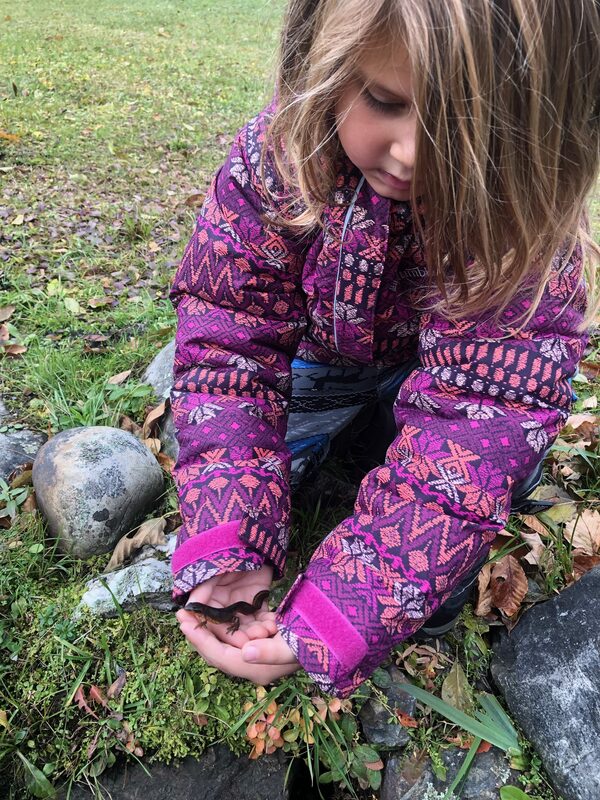 This entry was posted in family, forest school, homeschool, personal reflection, unschool, vermont. Bookmark the permalink. Beautifully and inspiringly written, as always, Linds! Thanks, dad! Can’t wait for you to visit! Thank you, mom! It’s been a great first week. I can’t wait for you to come up and help me envision the potential of the learning room/workshop area. Miss you! Thank you, Jessic! I was thinking about you as my girls were running around on our land and how you always say that the Pennsylvania land you grew up on is in your blood. I hope they feel the same way about this place when they grow up. So beautifully written! Will either of you work, or will you be living off the land? Such a gorgeous property! Thank you, Michele! Collin still has his job with Pure Charity; we are super fortunate that he can work remotely. But we do want to try to grow our own food and also raise animals here (not to eat, but just for fun). I’m so happy for you all. You took the time and had the patience to wait for the right place. So great to see how welcoming it is for you, and to know that you can all thrive there. Love you guys! Thank you, Judy! We love you too! Can’t wait until we are all settled in and you guys come to visit! !